After a day and a half with my new Nokia 700 I just wanted to post some quick feedback and first impressions. Having owned pretty much every type of Nokia phone before and being used to all the quirks of Symbian and Nokia devices there’s the good, the bad and the ugly with the 700 as well. Symbian Belle really lifts the OS to an Android’ish level. The UI is slick, transitions are smooth and the overall user exprience is just what you expect of a modern OS. Its hard to tell how much this has to do with the 1 GHz processor but everything is super fub-folders helps usability. The browser seems also faster than on Symbian Annaast. It will be interesting to see the first C7 vs 701 comparisons to find out how much actually is due to Belle and what is due to processor speed. The new widgets, arrangements on the home-screens and the pull-down status bar are great. If you have used Android or Bada before you know instantly how everything should work. Also the new Apps/Settings menu without s.
Hardware and form factor of the 700 are just amazing. To pack so much into a tiny phone is an engineering marvel. 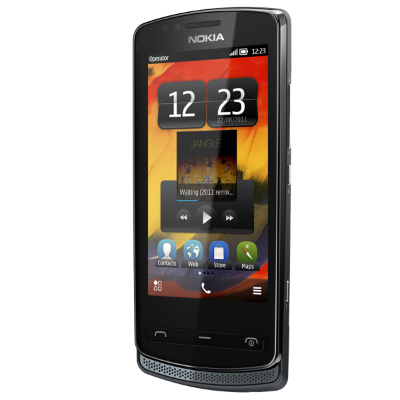 Also the built quality is up to the usual Nokia standards and what Nokia has always excelled on. The phone feels rock solid with zero flex. The screen is ultra sharp and has very deep blacks as you would expect from this AMOLED display. The metal battery cover gives the phone an additional premium feel. But the real beauty is the size of the Nokia 700. Once you hold it in your hand or drop it in your pocket you know that Nokia have created a tremendous phone package. I wasn’t able to test the NFC functionality since I didn’t have another phone to share it with. But given time and while NFC is catching on this will become a must-have inclusion in any smartphone and once again, Nokia have been the first to really push for this new hardware addition by integrating it in most new phones. The main drawbacks are the obvious casualties due to the size of the phone. The on-screen keyboard in portrait mode is very tiny and not very usable if you don’t have tiny fingers. It is significantly more usable in n landscape mode though you will still hit the wrong key more regularly than on bigger screen devices. The camera is another story. Nokia seem to have abandoned auto focus on most of their new phones so this one is fixed focus like on the other Symbian^3 phones (with the exception of the N8 obviously and the Meego N9). I am just not convinced of the quality and all arguments from Nokia engineers that customers want super-fast startup times and extra small phones if it comes at the expense of auto-focus. Especially if you want to take close-up shots of business cards or other printed material which I regularly do on my Blackberry. It’s also hard to understand why the camera was downsized from 8 to 5 megapixel. The only excuse would be the form factor and that the sensor didn’t fit in such a small body. Battery life relatively short given that the phone only carries a 1080 mAh battery. But taking that capacity into account the actual battery life is not bad. I still go through my first day with having enough juice left in the evening. After 1.5 days with the phone it has already grown on me (despite it’s small size or maybe exactly because of it). If you want a phone that packs everything a modern smartphone needs to have without lumbering around a huge phone like the E7, or the Galaxy S/S II phones, then this is the one to get. But beware of the shortcomings due to the form factor. The only real competitor I could think of at this moment seems to be the Sony Ericsson Xperia Ray. Everything else is already signficinatly bigger. I can’t help but thinking that if this would have been the first version of Symbian^3 when the N8 and C7 were released, Nokia might not have pulled the plug and migrated to Windows Phone 7. This is now a rock-solid OS, with a better memory and energy consumption footprint than any other mobile OS around. Sure, due to the “end of life” atmosphere around Symbian I don’t think that developers will turn back to Nokia and the Ovi Store will fall further behind. But a Nokia with Symbian Belle as the base and a Meego as the future would have been a force to be counted with, without the need for Windows Phone 7. Thanks for a great preview. I want to ask some questions, I’d be glad if you could answer them, How is the music player on it, is it as good as, say Nokia N8? It’d be great if you could tell me about the video codecs supported. And how are the fonts I mean are they legible on a screen this tiny? Gaming? Again would like to know somethhing more on battery life. Any lags, hangs or stutterings while doing something? (with considerable number of apps open in the background). Thanks in advance. thank you for the review. my question is: did you try to make a call? how ist the sound quality in noisy environment? woul be nice and very helpful to hear from you, thanks! I haven’t had any issues with the sound quality. As good as on my E6 and E7 that I used before. -The headphone output audio quality is very pleasant surprise, at least with 600 ohm hifi headphones. -Size and weight are great. -Do not know how to create similar widgets as the phone has originally installed for email. You can delete them, but can not create similar widget. The NFC is super fast, and having the aerial at the top makes it very usable. An app “Nokia Tag Writer” will write to blank NFC Tags. Not shown as compatible on Nokia Store but just download it anyway and install the .sis works great. Also I don’t know what your issue with the camera settings are. I’ll often change 4 or 5 settings to take one tricky photo then want to go back to normal settings so I’ll exit the camera and restart it. I think the settings going back to normal every time has prevented me from stuffing up lots of quick photos. I suppose remembering camera details or not is a matter of personal preference. Ideally it should work like in Windows Phone 7.5 in which you can select “save settings” to ensure next time you use the camera the same settings are applied. If you just exit the camera app then it goes back to factory defaults. I had my local store order one as soon as I found out about it. Finally a tiny smart-phone! After two days there’s one thing I haven’t figured out though. How to get the date (and weekday) to show on the start screen. Greatful for solutions to this! The date is displayed by default on the lock screen. If you chose the digital clock (not analogue) then it’s also displaying the date format including weekday). On the home-screens you can only display analogue or digital clock with the date, but it won’t display the weekday. However if you also add the calendar widget then at least with one click on the widget you get to the calendar displaying the weekday.